In 1982, teenager Tomika McNeal is arrested for committing Murder at Uncle Candyman’s Grocery after a witness identifies her, but she doesn’t know why this is happening. That’s the burning question in this stunning murder mystery that really begins 23 years earlier in 1959, when three students meet in high school. The teens include trouble maker Lynda Meyers, shy Vivian Brown, and spoiled mama’s by Jonathan McNeal, who always gets what he wants. The three classmates forge a lifetime friendship, and Jon and Vivian eventually get married. 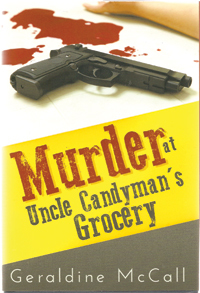 When their daughter Tomika is arrested for killing the nigh clerk at Uncle Candyman’s Grocery, Tomika can’t understand why she was identified. Is she the killer or is this a classic whodunit? Turns out that their friend Lynda Meyers is now a detective. Can she figure out what really happened? If you want to find out who committed the crime at Uncle Candyman’s Grocery, get your copy on April 24,2019 at the African American Library and Cultural Center from 5:30 until 7:30. This book is also available on Amazon, Goodreads and at BarnsandNoble.